All-inclusive gardens are becoming more popular as people embrace the sustainability movement. People want to grow their own food but still would like to have a lovely garden. Therefore, incorporating herbs, fruits, and vegetables in their landscape is a practical move that is also aesthetically pleasing. All-inclusive gardens offer gardeners several advantages. The large space makes it easy to tend to multiple plants at once and keeps everything neatly together. A pleasing layout can also create a lovely spring, summer, and fall outdoor space. If you need help downloading the printable layouts, check out these helpful tips. This bed is similar to the mixed garden border that your grandparents may have tended. This layout includes a number of all-time favorite perennials, herbs, annuals, fruits, and vegetables. A grape arbor provides vertical interest at the front of the bed. Download and print this rectangular layout. This all-inclusive bed includes a pond and some benches to make the perfect spot to relax and unwind. Surrounded by fruit bearing trees and shrubs, this bed makes use of attractive containers for growing vegetables during the summer months. Not only is this bed highly practical, but also beautiful. A natural wattle fence encloses this garden for privacy. 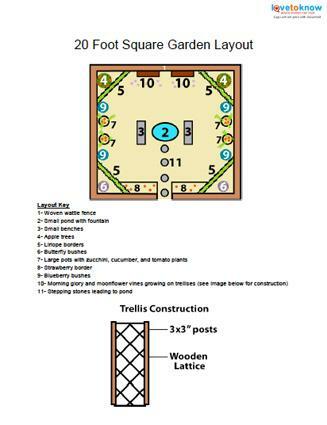 Use this square layout for your garden. Gardeners who don't want to tackle creating a large gardening space or caring for a variety of plants can always choose a garden layout to meet their specific needs, whether they want to make a vegetable garden, flower garden, or herb garden. 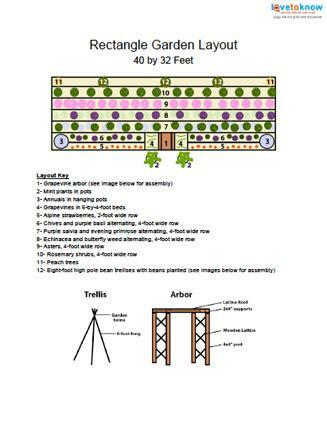 Create vegetable gardens using raised bed plans and layouts. Consider a variety of things before starting your vegetable garden, such as watering issues and your garden style preference. A garden where all the flowers come back year after year is easy to tend and maintain. 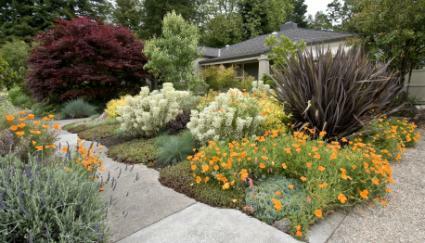 Perennial gardens are a great way to spice up your landscape without having to worry too much about maintenance. Pair the right plants together for the most dramatic effect. Herbs are fragrant, attractive, and highly practical. Learn how to plan an herb garden layout that makes the most of your gardening style, whether you choose to plant in containers or in the ground. Don't be afraid to step outside of the box and mix and match a wide variety plants in your garden. Utility gardening is on the rise and is a method of gardening that is based not only on aesthetics, but also on a desire to make the best use of space and money in pressing economic times.